Honey Bee Manufacturing was founded by brothers Greg and Glenn Honey and their wives in 1979. What started as a small business on their farm in Bracken, Saskatchewan, with a simple rod weeder attachment as their only product, quickly grew into so much more. Over the years, their product line expanded and so did their business. Fast forward to today and Honey Bee Manufacturing has over 100,000 sq. ft. of production and warehousing space in Frontier, Saskatchewan, enabling them to provide customers from around the world with a diverse offering of draper platforms. They`ve come a long way from those days on the farm. With a strong commitment to product research and development, Honey Bee’s objective has always been to manufacture equipment farmers want and are happy to own. So far, so good! 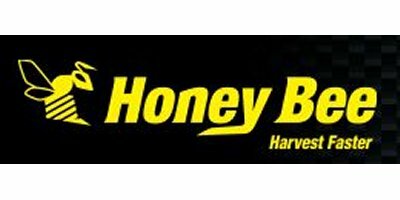 Honey Bee’s product line includes a diverse offering of draper platforms including the Grain Belt Header, Grain Belt Swather and Rice Belt Header. Attaching to most combines and many of the windrower tractor units in the market today, the draper platform technology continues to prove itself in many countries and a wide variety of crops and conditions. With a strong commitment to product research and development, Honey Bee’s objective is to manufacture farm equipment that farmers want and are pleased to own. Honey Bee Manufacturing Ltd. is a family owned business that was incorporated in 1979 by brothers Greg and Glenn Honey and their wives. At that time, the company operated from their farm at Bracken, Saskatchewan and a simple rod weeder attachment for tillage equipment was the first product they produced. In 1980, Greg and Glenn developed a 67' self-propelled swather, which led to the development of a tractor-mounted swather (TM Series) two years later, which Honey Bee manufactured for a number of years. In the fall of 1987, the brothers made the decision to move the company to Frontier, Saskatchewan. Their new location was a much larger facility offering the opportunity for increased production capacity and product line expansion. With the most recent plant expansion (completed in 2001), the company now has over 100,000 square feet of production and warehousing space, enabling them to offer the variety of draper platforms you see today.